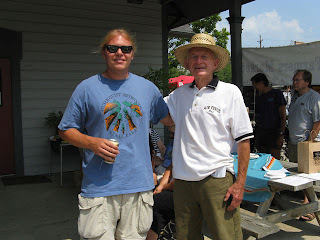 [August 21, 2010, East Dundee, IL] While growing tomatoes is for sustenance, it's also a social endeavor, according to 82 year-old East Dundee resident Norm Thomas. "I do it more for fun and for friends," Thomas said. "I end up with tons of them for family and neighbors. I grow them mainly to share them with people." August marks the height of tomato ripening for the area, which is why those with a knack for spawning a huge varietal came to the Dundee Township Visitor's Center on Saturday. 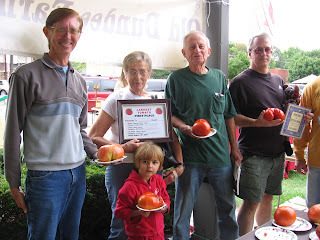 Area residents flocked to the 13th annual Largest Tomato Contest to hopefully share in the $1,000 in prizes being doled out. Thomas took first place for his two-pound, eight- and one-eighth-ounce giant split-apart fruit that was, perhaps, better for weighing than for eating. "I didn't want to eat that one; it was bad news," Thomas said with a laugh. Second place, with a tomato weighing just one-eighth of an ounce less than Thomas', went to Elgin resident Adam Tobler. Third place was captured by his father, Steve Tobler, who grew a two-pound, four-ounce tomato, followed by Gail Russell in fourth place, with one weighing two-pounds, three-and-five-eighths ounces. Twenty-four entries in all were brought in to the contest on Saturday. Tomatoes were judged by weight, and could be red, green, or any variation of ripeness in between. Prizes, donated by area merchants, such as Old Country Buffet, were given out for first through fourth places, and totaled $400, $300, $200, and $100, respectively. Other business donors included Dundee Landscape Nursery, Liberty Lanes, Diamond Jim's, Dairy Queen, Olive Garden, and Red Lobster. 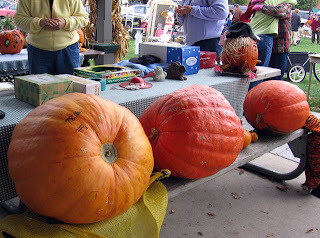 Dundee Township Visitor's Center board member Bill Zelsdorf runs both a tomato- and pumpkin-growing contest each year primarily for fun, but also to highlight the Visitor's Center at 319 N. River St., as well as the weekly farmers market held on its grounds. "It has to be fun. Otherwise, what's the point?" said Zelsdorf, who is also the new coordinator of the farmers market. "The vendors really enjoy it, and it brings attention to our market and center." The Old Dundee Farmers Market is open from 8 a.m. to 2 p.m. each Saturday through October and features various vendors selling locally grown produce, plants and flowers, collectibles, antiques, and jewelry. Thomas, who has won second and third places in the contest in past years, said he doesn't really have a secret to growing larger tomatoes in his backyard -- only the second of two East Dundee homes he's lived in. Maybe Thomas' success stems from his motivation to share his crops -- which also include cucumbers and peppers. "I think it's just good soil, and I use Burpee seeds, which I order each year," he said. "I do raise my own plants from seed, which seems to help. It's just fun to share them with other people." Shown here is this year's winner in best decorated, 13-year-old Ryan Saxon. Last year, Ryan took home second place in the biggest-pumpkin category, so decided to try his hand at decorating this year. 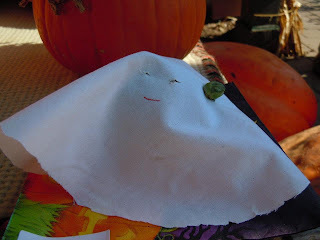 "I've been collecting Peanuts stuff all my life, and I love Halloween," he said. 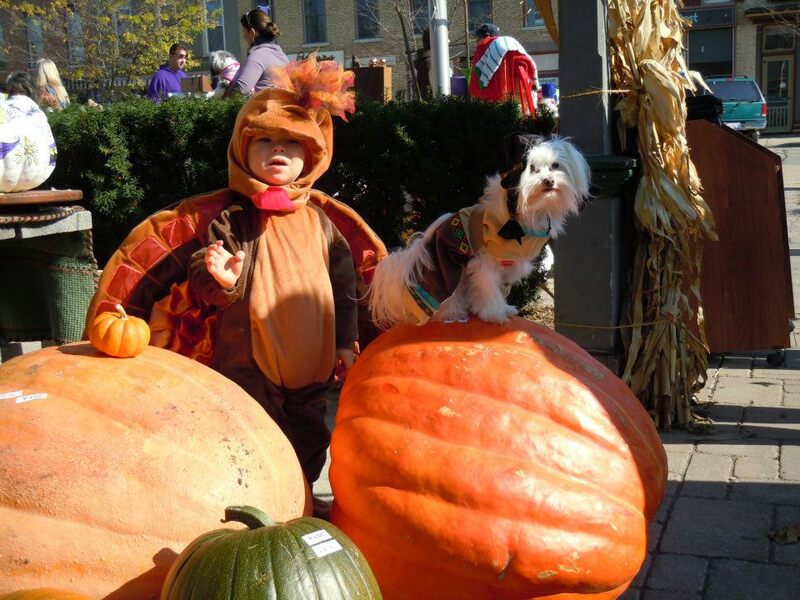 EAST DUNDEE — While it was no easy task lugging giant pumpkins to the Dundee Township Visitors Center, it was well worth it in the end for several area residents who captured a virtual boatload of prizes. Mike Wilson’s 175-pound pumpkin topped the scales in the weight division, followed by 132- and 113-pound runners-up. Wilson, who lives in the village, said it was the first time he had ever grown a pumpkin and just got lucky. "I didn’t do anything more than put the seed in the ground and water it," Wilson said. "It was the luck of the seed." The giant squashes, suitable for making at least a dozen pies apiece, were the highlight at the center’s 13th annual Great Pumpkin Contest on Saturday. However, size wasn’t the only factor being weighed by the ten-member panel of judges. Those with a creative flair captured half of the $1,200 in prizes up for grabs. 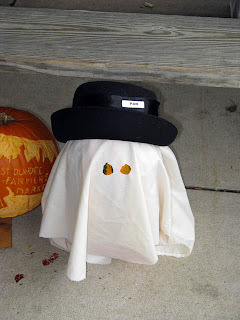 Bill Zelsdorf, who has run the contest since its inception in 1999, said that the event is a fun way to highlight the Visitor’s Center at 319 N. River St., as well as the farmers market held on its grounds, May through October. The top prize in the decorating category went to 13 year-old Ryan Saxon of Oakwood Hills. Saxon, whose father is a vendor in the market, is admittedly obsessed with Peanuts characters. He created a graduated tower of seven pumpkins as a tribute, with the face of Linus carved into one and a picture of Lucy drawn on another. "I am fascinated with Peanuts stuff, and thought it would be cool to do a ‘Great Pumpkin’ theme," Saxon said. Zelsdorf announced first, second, and third place winners in both categories, doling $300, $200, and $100 respectively in gifts and gift certificates from local merchants. Merchant donors included Old Country Buffet, Dundee Landscape Nursery, Haeger Potteries, Barb's Studio 104, Diamond Jim’s Gas Grill, Liberty Lanes, One Cut Above the Rest hair salon, and Piece-A-Cake Bakery, among others. While Zelsdorf receives many thank-you’s at the event, he is quick to tell anyone listening that the sponsors are the real reason the contest is a success. "They are just wonderful," Zelsdorf said. "They get hit hard by so many people looking for donations. But they wait until I come in…and save things for me." The farmers market — which assembled for the last time this season on Saturday — had a good year, Zelsdorf said, despite some rain. "It was still a huge success," he said. "It’s hard to not be, with so much to offer and a great family of vendors." A vivid imagination led winner to ask, "Where's the beef?!" 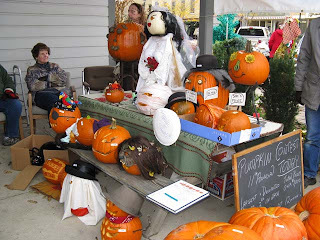 Shown here are winners of best decorated/carved pumpkins in the Great Pumpkin contest hosted by the Dundee Township Visitor‘s Center. From left are Lenore McDonald (3rd) of East Dundee, Karin Nedli (2nd) of Carpentersville, contest organizer Bill Zelsdorf of Carpentersville, and first-place winner Sharyn Joseph of Gilberts. Winners took home a combined total of $600 in merchandise and gift certificates donated by area businesses. [Oct. 31, 2010, East Dundee, IL] It was a bit of imagination and perhaps low blood sugar that inspired this years' winner of the annual Great Pumpkin contest hosted by the Dundee Township Visitor’s Center. Area businesses donated $1,200 in prizes that went to winners in two categories: heaviest (by weight) and best decorated/carved. The 12th-annual contest also marked the end of the season for the Dundee Farmer's Market. Six creative entries gave the panel of 10 judges a challenge, since only the top three vote getters took home prizes for best decorated/carved pumpkins. Designs included hand carved grimaces, a black cat, a superhero and a pan of pumpkin cupcakes. 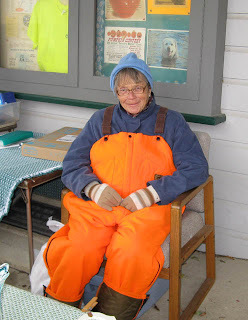 Lenore McDonald of East Dundee used swim goggles, a "dew rag" and a bed-sheet cape for her third-place “Superhero Bill” entry, which coincidentally had the same name as contest organizer Bill Zelsdorf's. "I need all the help I can get," McDonald quipped. Zelsdorf (sans cape) was on hand to announce first-, second- and third-place winners in the weight and decorating categories. Winners received $300, $200 and $100, respectively, in combined gifts and gift certificates from local merchants such as Olive Garden, Old Country Buffet, Liberty Lanes bowling alley, Barb's Studio 104, Diamond Jim's, and Dundee Nursery. Karen Nedli of Carpentersville took second place with her "Jesse the Black Cat" pumpkin, while first place went to Sharyn Joseph of Gilberts for her giant hamburger and fries. Joseph used a large pumpkin as the bun and dragged a wooden stepping stone out of her garden (aged to medium well) for the burger, which was accessorized with lettuce, pickles, cheese, onion and condiments just before show time. "One day I looked at that stepping stone and said, 'That looks like a hamburger!'" she recalled, noting that possibly she was hungry at the time. In the largest pumpkin category, a 140-pound gourd in a sagging wheelbarrow earned $300 in merchandise and gift certificates plus a framed certificate for the Brewer family of East Dundee. Cyndi and Peter Brewer used the adjacent bike path to wheel their record-setting entry alongside son Blake's stroller. Twelve-year-old Ryan Saxon of Cary came in second with an 87-pound pumpkin, and Tim and Heather Horcher of Marengo came in a close third place, winning $100 in gift certificates for their bright orange pumpkin that weighed in at 84 pounds. “As always, we had great entries, and we’re always so grateful to the businesses that donate all the prizes," Zelsdorf said. "It's a fun way to bring people down to the market, and it's a nice way to end our season." Other prize donations included merchandise and gift certificates from Dundee Dairy Queen, Piece-A-Cake Bakery, One Cut Above the Rest salon, Dundee Manor restaurant, Denny’s, West Dundee’s Jewel/Osco, Phil Aleo, Haeger Potteries, and Wal-Mart. The Dundee Township Visitor’s Center will remain open weekends through December 4th, which is the weekend for Dickens in Dundee. For more information about the Visitor's Center or next year's Farmer's Market, visit www.dundeedepot.com, or find "Dundee Depot" on Facebook. The Brewer Family -- 14-month-old Blake, Cyndi and Peter -- of East Dundee took first place with their 140-pound pumpkin. The 12th-annual event was hosted by the Dundee Township Visitor's Center and marked the end of the market season for 2010. Here's Sharyn Joseph's winning pumpkin hamburger aged to "medium well." 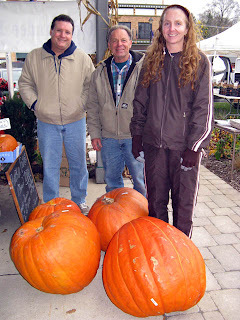 Tim and Heather of T&H Farms with their 84-pound pumpkin. Mrs. Pierson of East Dundee carves a great pumpkin every year! [August 18, 2008, East Dundee, IL] Forget the fertilizer, the secret to giant tomatoes is music. At least that’s the case for Ronald Johnson of Elgin, who took first prize in this year’s largest tomato contest held Saturday at the Dundee Township Visitor’s Center. There were 19 entries of all shapes, sizes, colors and ripeness ranging from a string of tiny green grape tomatoes to giant love apples that resembled misshapen 16-inch softballs. Fortunately, neither beauty nor ripeness was a factor in judging, said event organizer and visitor’s center board member Bill Zelsdorf of Carpentersville. First place winner Johnson, who raised his entry from seeds, did use some Miracle Grow on his two-pound six-and-one-eighth-ounce Beefsteak tomato, but he also sang or whistled to his entry regularly. Johnson took home $500 in gift certificates and prizes from area businesses, including garden-themed merchandise from Dundee Landscape Nursery, Old Country Buffet meal passes, Classic Cinemas movie passes, and gift certificates from Olive Garden Restaurant and Piece-A-Cake Bakery. Larry Fettes of East Dundee came in second with a two-pound three-and-one-fourth-ounce heirloom tomato, also grown from seeds. He won $300 worth of prizes, including merchandise from Dundee Landscape Nursery and Spring Hill Mall, and gift certificates from Red Lobster, Dundee Dairy Queen, and Piece-A-Cake Bakery. Steve Page of Gilberts grew his tomatoes from seeds imported from Italy and took third place and $200 in prizes for his two-pound three-ounce entry, while Ramona Johnson (wife of first-place winner Ronald) of Elgin won $100 in prizes with her two-pound three-ounce tomato (ties went to the earlier entry). “He got up early and snatched the biggest one,” Ramona quipped. Other donations for the 11th-annual contest came from One Cut Above the Rest salon, Denny’s, Manor Restaurant, Liberty Lanes, and Phil Aleo, who donated a copy of his history book, Dundee Township Moments Frozen in Time. 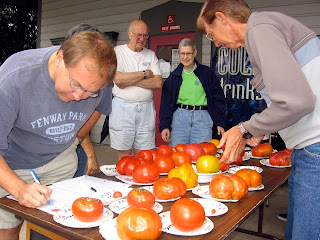 [August 18, 2007, East Dundee, IL] It’s been a good year for tomatoes in Dundee Township, at least judging by the turnout for this year’s largest tomato contest held Saturday at the Dundee Township Visitor’s Center. There were 34 entries of all shapes, sizes, colors and ripeness ranging from a tiny grape tomato to giant love apples that resembled misshapen playground balls. Fortunately, beauty was not a factor in judging, said event organizer and visitor’s center board member Bill Zelsdorf of Carpentersville. 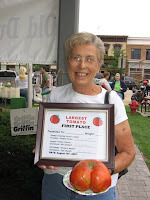 Glenda Christie of Carpentersville took first place with a Big Zack tomato that weighed in at two pounds, two and three eighths ounces. She took home $400 in gift certificates from area businesses, including $95 in Old Country Buffet meal passes, Classic Cinemas movie passes, and a $50 savings bond from Cardunal Savings Bank. “This was actually my first year gardening,” Christie said, “my husband always did it, but he’s been ill, so I took over.” Christie said she didn’t do anything special with her winning entry other than water it and watch it grow. “Something did take a bite out of it just before I picked it, so we were a little worried,” she added. Norm Thomas of East Dundee was a close second with his Super Steak tomato, which weighed two pounds, one and one quarter ounces. He won $275 worth of gift certificates, including $50 to Dundee Landscape Nursery, 12 games of bowling at Liberty Lanes, and $78 in passes from Old Country Buffet. Mike Bateman of East Dundee took third place and $150 in prizes for his two-pound five eighths-ounce entry, and Audrey Kellner of West Dundee won $100 in prizes with her two-pound one-quarter-ounce tomato. Here are all of our winners. Shown here from left are event organizer Bill Zelsdorf with winners Glenda Christie, Norm Thomas, Mike Bateman and our youngest competitor Audrey Kellner. Congrats to our winners! Other donations for the 10th-annual contest came from One Cut Above the Rest salon, Piece-A-Cake Bakery, Red Lobster, Olive Garden, Spring Hill Mall, Jewel Food Store, Denny’s, Dairy Queen, and Manor Restaurant. The Visitor’s Center will host its Great Pumpkin contest in October, with prizes for heaviest pumpkin and best decorated pumpkin. Watch this space for details! Our own resident cowboy David Carter (yes, he's available for hire!) of Hat Creek Enterprises, gave an impromptu poetry recital. Little did he know he'd end up on you tube! It's just one of the many value-added services we offer our market vendors. Check out David's site and definitely try his BBQ sauce, it's fabulous. It contains none of that wussy high fructose corn syrup either! Just spices, fire and a whole lotta love. 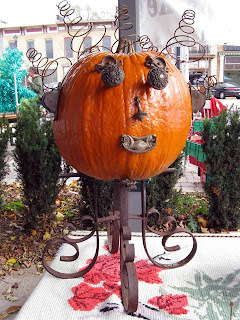 EAST DUNDEE -- It was officially a family sweep in the Dundee Township Visitors Center's annual pumpkin contest. Father and daughter contestants, Steve and Bridget Jacobsen of East Dundee, each took home first place wins Saturday in the weight and decorating categories, respectively. Steve Jacobsen's 119-pound pumpkin topped the scales in the weight division, followed by the 100-, 70-, and 30-pound runners-up. Lugging the winter vegetables to the center was well worth it in the end for the top three entrants in both categories, as more than $1,000 in prizes was doled out. However, size wasn't the only factor at hand, as far as the members of the Visitors Center were concerned. Those with a creative flair captured half of the prizes up for grabs, such as 14 year-old Bridget Jacobsen's painted green turtle, made from one large pumpkin with smaller ones attached for the head and legs. 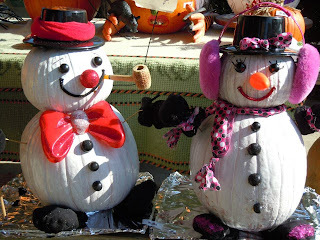 The pumpkin contest was held in the bustling Old Dundee Farmers Market, which assembled for the last time this season. Bill Zelsdorf, who has run the contest for 10 years, said the event is a fun way to highlight the Visitor's Center at 319 N. River St., as well as its seasonal farmers market held every Saturday from May through October. Year after year, the market has gained more vendors, and more followers, Zelsdorf said. "It really helps draw attention to our farmers market, and this has been one of the best years we've ever had. We had 50 or 60 vendors each weekend," Zelsdorf said. "But the number one reason we do the contest is fun. It brings our customers and vendors together, and welcomes in the community." First, second, and third places were awarded for the weight and decorating categories, along with a decorating category for kids, which was captured by Sara Anderson of Elgin. While the Jacobsens each took home $250 in prizes, the remaining $565 in merchandise was doled among the rest. 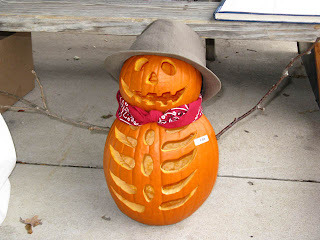 Susie Bird's pumpkin took second place in the weight competition, followed by Joseph Bobbitt's. Bob Weilbacher took second prize in the decorating category, and Karen Nedli gleaned third. In total, the winners received hundreds of dollars worth of goods and gift certificates from area merchants who donated the items for the cause. 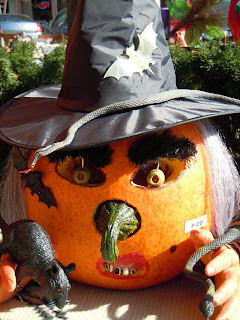 While Steve Jacobsen said he admits there's really no special secret to growing his large pumpkins, he has a sneaking suspicion why everything in his backyard seems to do well. He's got a built-in composter, Jacobsen admitted with a smile. "I didn't have my seeds shipped in like a lot of people do. I just got them off the rack up at Wal-Mart," he said. "I do have a sewage plant behind my house though, and everything in the garden seems to do pretty well." OK, not really, but we did have a dog enter...and win second prize! Twelve-year-old Sharky Mahoney won second prize in the kids' decorated pumpkin category -- not bad considering he doesn't have thumbs. 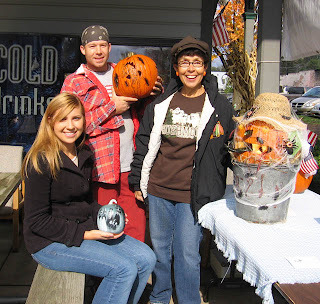 This was the 9th year for our annual Great Pumpkin contest, which marks the end of the season for our Dundee Farmer's Market. Area businesses donated over $1,500 in prizes that went to winners in three categories: heaviest, best decorated/carved, and best decorated/carved kids 12 and under. Here are this year's winners! 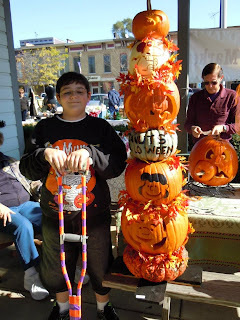 Third Place: Stephanie Domagalski, (seated with painted pumpkin), $100 in prizes; Second Place: Mike Cuniff (tatooed pumpkin), $200 in prizes; First Place, Joann Scott (bucket head), $300 in prizes. 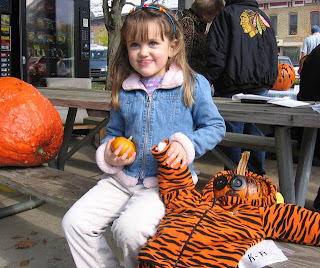 First place winner in the kids' category was Natalie with her tigger pumpkin. Second place went to Sharky the dog (not pictured) for his barfing pumpkin. There were no other kids' entries. The mother-daughter team of Nicole and Jennifer Liebman took first and second place with their 78- and 71-pound gourds (a total of $500 in prizes!). Susan Bird came in a distant but enthusiastic third with her 45-pound entry, which won her $100 in prizes. Thanks to all who joined in the fun, and special thanks to the generous businesses that donated prizes: Old Country Buffet, Piece-A-Cake Bakery, Spring Hill Mall, Dundee Landscape and Nursery, Classic Cinemas, Olive Garden, Manor Restaurant, Phil Aleo, Dairy Queen, Red Lobster, Denny's, Liberty Lanes, and One Cut Above the Rest.